Friday, the markets were not affected much by the jobless data. 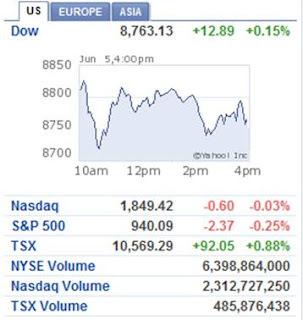 Overall this week, D0w was up +3.09%, S&P500 +2.28% and TSX +1.92%. Oil was at $68.38. The US unemployment rate in May is at the highest in 25 years, at 9.7%. When close to 1 in 10 people is out of a job, people are going to continue to cut spending and are likely to default on their debts. We, the Canadians, are not a lot better. Our unemployment rate is at 11 year high, at 8.4%. The province of Ontario is the worst due to the weakening automotive and manufacturing industries. Employment recoveries typically lag economy turnarounds. So, economists predict that the jobless rate is going to get higher. Oil prices going back up is probably going to bring the jobless rate even higher.